The Results Looks Amazing, But Is Sealcoating Worth It? entire surrounding – your lovely garden, manicured yard and tastefully maintained home exterior. On the contrary, not maintaining your driveway becomes a blot on the landscape. So it is a must that a driveway should be maintained not only for pleasing the eyes by creating a proper and attractive appearance but for the longevity of the asphalt. Asphalt is the prime binding as well as the surface coating material and it does degrade over a period of time. Contrary to what you may think degrades your driveway it is often not the traffic damaging your driveway but instead weather caused by ultraviolet light and chemical breakdown. While you may like maintaining a clean, smooth, attractive surface, adverse effects of these silently keep damaging the asphalt coating gradually over time. 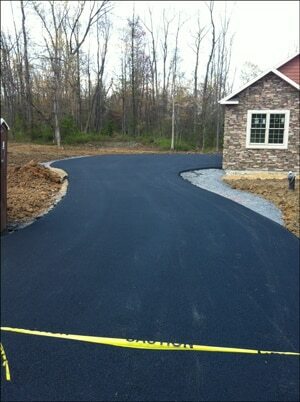 And laying a whole new driveway is expensive, therefore it pays to ensure the longevity of your asphalt driveway. Sealcoating your driveway right the first time is important because when you try to do multiple frequent repairs you will be nickel and dimed excessively. Everybody’s pocket is burning due to increasing fuel prices, and asphalt being the byproduct of petroleum, asphalt prices have also risen over time. Therefore, preventing the damage to the asphalt coating is becoming a better answer to the problem than frequent repairing. At this point, you’re halfway through, but you may still be asking “is sealcoating worth it?”. The answer is “YES” and here’s why. Sealcoating fends off damaging actions of the chemical reactions and ultraviolet radiation. These damaging agents are otherwise too difficult to tackle with the prolonged exposure to the outdoors environment. Sealcoating has been tested and tried for years under varied weather conditions for protecting driveways. It prevents cracking of the asphalt surface in freezing temperatures hence it delays the recurrence of expenditures on maintenance. Sealcoating helps in cutting down on the infiltration of water through surface cracks. When water gets into these cracks, over time it changes from a liquid to a solid. Then the expanded volume increases pressure resulting in more cracks. Due to decreased surface cracking, you can be sure of having your driveway looking freshly laid for a longer period. Leaking fuel or an oil spill on the driveway is another major problem. This happens because oil reacts with asphalt or dissolves the molecules leading to weaker adhesion of the asphalt. You will often find large fissures on heavy oil spilled patches. Hosing down the driveway with water is not a solution to remove the fuel to the extent of preventing chemical reaction between asphalt and fuel oil. Ultraviolet radiation from the sun has damaging effects on the asphalt surface. Continuous exposure to sunlight speeds up the damage on already worn out roads. The suns rays weaken the capacity of the adherence of aggregate particles and asphalt to give away to chips easily. Sealcoating has been very effective in slowing down the effect of UV rays. Last, but the most important benefit of seal coating is the costs savings on driveway maintenance. It’s an easy coating applied on the surface every few years. This is much cheaper than re-laying asphalt or even patchworks. You can look for quite attractive savings from driveway sealcoat in the long run. Along with the pride of having a nice driveway. We’re the most efficient local asphalt contractors in Central PA.